Today I am super excited to host a guest blog post by my amazing friend Jahn Kidd. Jahn has a background in psychology and is currently working towards an engineering degree (Go Jahn!). He wanted to share some of his knowledge on the inner workings of the human brain. Get excited to learn! Now, you may be thinking “So what? It’s a man navigating a pretty simple obstacle course. Anybody could do that.” And you would be correct. Except for one thing (if somehow you haven’t noticed the video title): the man in front is blind, but reacting to the obstacles in his path the way you or I would react. And the man behind him is a researcher, shadowing the participant in case he should stumble over one of the obstacles. This is a demonstration of a visual phenomenon known as blindsight. To begin with, let’s get into a quick and dirty explanation of the human visual system. The visual system consists of the eyes (obviously), some nerve tracts, and the all-important visual cortex (otherwise known as the occipital lobes, located at the rear of the brain, seen in Figure 1). As you can see from Figure 2, the nerves from the eyes project subcortically (where the green arrow in Figure 3 is pointing, an area near the center of brain and below the cortex; Remember this- it’s important later), before continuing on to the visual cortex. 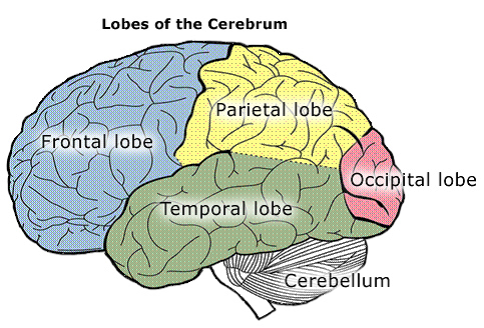 It is in the occipital lobes that much of the information is processed and responsible for the conscious experience of sight. If it helps, imagine the nerves as roadways and the visual information as cars that move along those roadways. These cars enter the roadway at an on-ramp (the eyes), and eventually arrive at a large intersection (the subcortical area of the brain). Most of the cars will continue further along the main road to their destination (the visual cortex), while some cars will take side roads to other areas (other parts of the brain that aren’t the visual cortex). The next important thing to consider: Blindness. The definition is pretty simple, we all know it: blindness means you can’t see. But what may not necessarily be known is that there are a few ways that blindness can occur. Blindness can be caused by injury to the eyes, or by congenital defect (i.e. the nerve tracts develop abnormally in the brain), or by damaging the visual cortex (specifically an area known as the striate cortex, or V1). This last cause is important for blindsight: being cortically blind means that the other organs and nerves important to sight are still functional. Blindsight is a phenomenon that has been actively studied for several decades, first being noticed in animals and then later in humans. Commonly, patients are only blind in part of their visual field (the striate cortex in the occipital lobes isn’t completely destroyed, only damaged). As you can see from the video, and from other studies, people who are cortically blind are able to respond to various stimuli that are presented in the blind areas of their visual field. Importantly, they do this at levels significantly above chance. This can include being able to navigate an obstacle, to detecting when lights are flashing, when objects are moving, and even the size of objects in some cases. 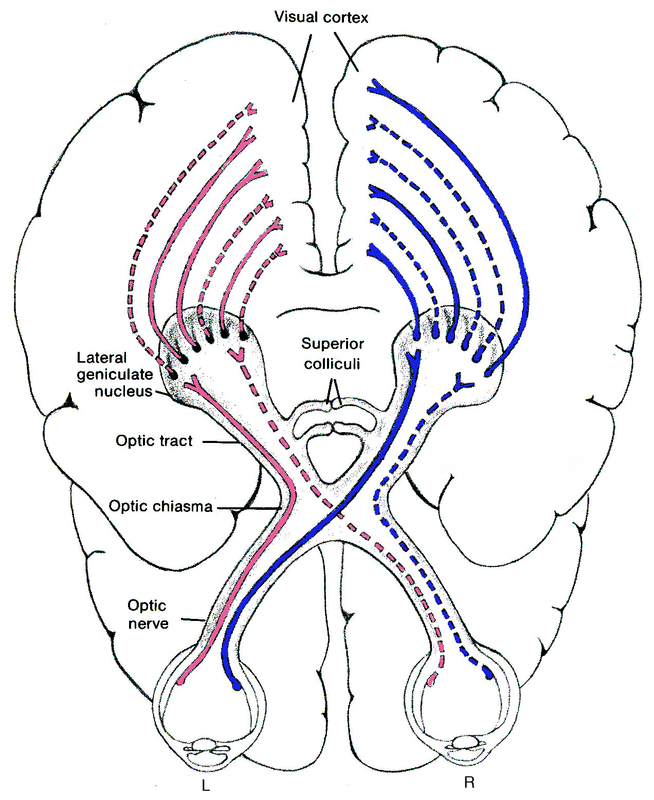 Remember that I said it was important that the optic nerves projected to subcortical areas? This is thought to be the mechanism through which blindsight may occur. Visual information is projected to several other areas in the brain, which can then possibly pass that information further along to other areas. This means that even when the V1 is damaged/destroyed, there is still visual information making it to other areas of the brain to be processed on some level. Continuing our earlier car and roadway analogy, this means that the main roads are completely or mostly blocked, which prevents those cars from reaching their destination (the visual cortex). But the cars that are taking the side roads are still able to reach their destinations (the other areas of the brain). It’s important to note that this is an ongoing field of investigation: this phenomenon has implications about the way in which we are affected by things in our visual field (evidently, conscious awareness of a stimuli is not always necessary). There are also questions about the physical mechanisms that some blindsight capacities may depend upon in certain instances, about how to predict if blindsight will occur in a region of blindness, about rehabilitation of visual sensitivity and discrimination, and about brain activity during blindsight. These are important questions about a fascinating (and as one researcher put it, rare) discovery in the field of psychology, and science in general. My goal here was to briefly expose you, the reader, to an interesting and perhaps little known phenomenon. It’s beyond my abilities to give a thorough enough explanation in a blog post, so I encourage you to read to further on the subject, even if it’s just the Wikipedia article. For those interested in further reading, I’ll provide the information on a relatively easy to read article about blindsight below.